Dinant is a compact francophone town in the Province of Namur in Southern Wallonia, Belgium. While Belgium is characteristically thought of as a flat country similar to the neighbour, the Netherlands, Dinant and the surrounding area strike a disconcerting chord against the idea. 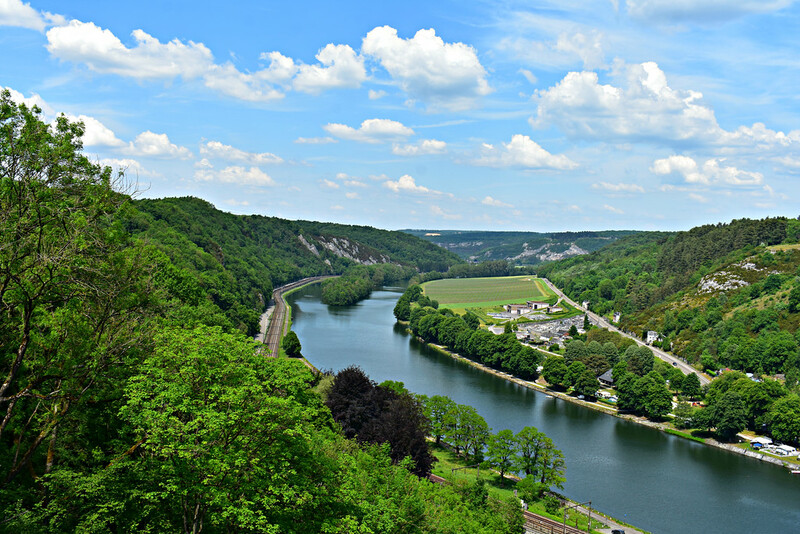 Perched on the Meuse river below sheer rock faces and green foliage, Dinant is a lovely French Belgian town in the hilly Belgian Ardennes and a pleasure to explore as a day trip from any of the major cities in Belgium. Dinant is a compact city and easily walkable within an hour. Considering how narrow some of the streets are it can be more pleasurable to walk than drive so make sure to explore the town at a leisurely pace! Arriving in town drive through the impressive rock passage two kilometres South of the centre of Dinant. According to the legend of The Four Sons of Aymon, Bayard was the name of a horse that carried the sons of the prince of the Ardennes safely away from a vengeful emperor. Just as the troops were upon them Bayard leaped across the river Meuse striking the rock as he jumped causing the break. 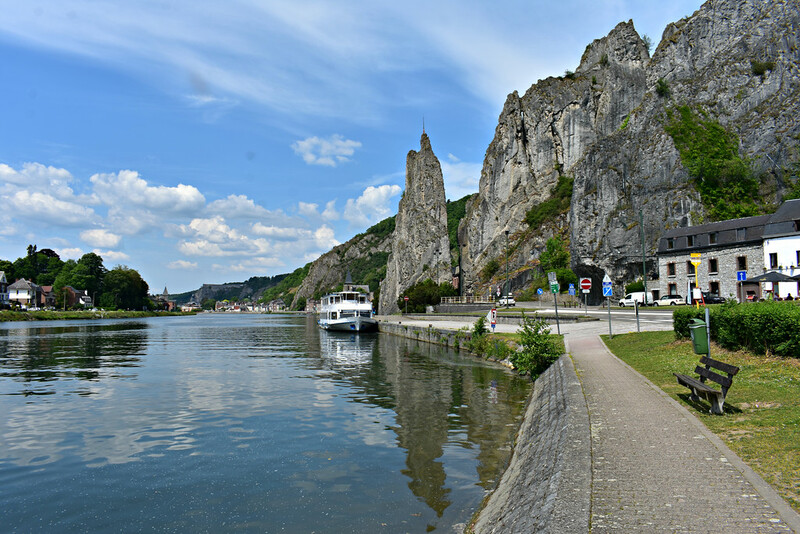 In actuality, French troops carved a passage through the rock to facilitate an invasion on Dinant and the surrounding feudal towns in the 17th century. The road widened as the years passed and is currently used for Northbound traffic. 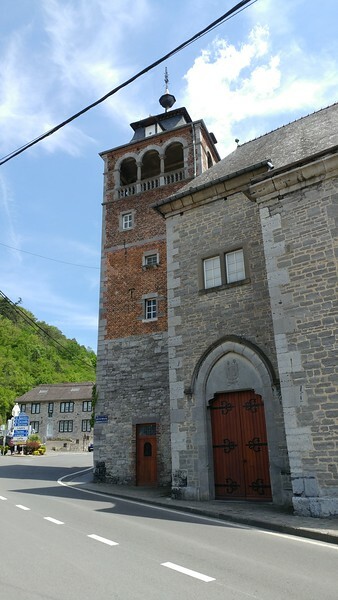 The Notre Dame of Dinant is a 13th century cathedral in the centre of Dinant. A door from the 10th century church that used to exist in the same space was incorporated into the current place of worship. The bulbous shape of the spire was added in the 17th century. The beautiful stained glass windows are among the largest in Europe. Let your eyes wander over the mosaic of colors and patterns in the window in the calm stillness of the church. The church is a wonderful respite from the heat wave and activity in the town. Staunchly situated on a 100m cliff overlooking the city Dinant and the river Meuse is the fortified citadel of Dinant. The present fort was built in the early 19th century but the earliest fortifications on this strategic position date back to the 11th century. Those looking to incorporate some exercise in their day should climb the 408 steps that lead to the top of the citadel. Otherwise a quick one minute journey by cable car will whisk you to the top. The vantage point from the citadel affords great views of the valley below and inside the museum you can learn more about the citadel and the history of Dinant. Check their official website here. The Charles-de-Gaulle bridge in the heart of town is named after a former French president wounded in Dinant in WW1 prior to becoming the head of his country. The bridge provides excellent views of town along the river meuse. In 2010, colorful saxophones were placed on the bridge as a tribute to various countries in the European Union. When we visited we also spotted saxophones depicting iconic symbols from non-European countries along with that country’s colours. One of the most famous people to have come from Dinant is Adolphe Sax, the inventor of the saxophone. Music lovers can learn more about Adolphe Sax at Maison de Monsieur Sax, a free interpretative center dedicated to the man. Keep an eye out for more saxophones as you explore the town! TIP: If you are musically inclined, visit the Maison de la Pataphonie (House of Pataphony), a 15th-century house where you can experiment with instruments made from everyday household objects! 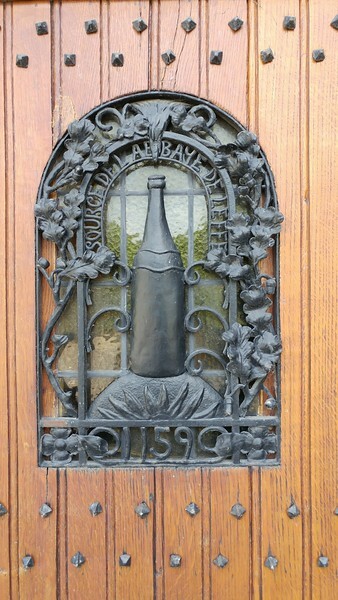 Strolling through town along the East banks of the Meuse about a kilometer North of town brings you to the Abbaye Notre Dame de Leffe, where a former brewery used to exist within the monastery. On the West banks of the Meuse River, Leffe beer enthusiasts can visit the Maison Leffe, a hotel and museum, to learn more about the history of the beer and the abbey. Take part in an interactive tour on the brewing process of Leffe beer and experience, sample three different Leffe flavours and take home a free glass. Check opening times here. Using the offline navigation app MAPS.ME we spotted a few viewpoints in the area. The first one was a local trail in town that led us up a hill to the West of the Dinant fort. While we were happy to get our daily walk count in, the views at the top was partly obstructed by branches. However the shade was a welcome relief from the burning glare of the sun though as temperatures peaked between 30 to 35 degrees Celcius. In the distance we spot the Crèvecoeur Castle Ruins in above the neighboring village of Bouvignes on the West banks of the Meuse River. Stroll casually along the river Meuse that runs through three European countries (France, Belgium and the Netherlands) on foot admiring the colorful buildings by the water. 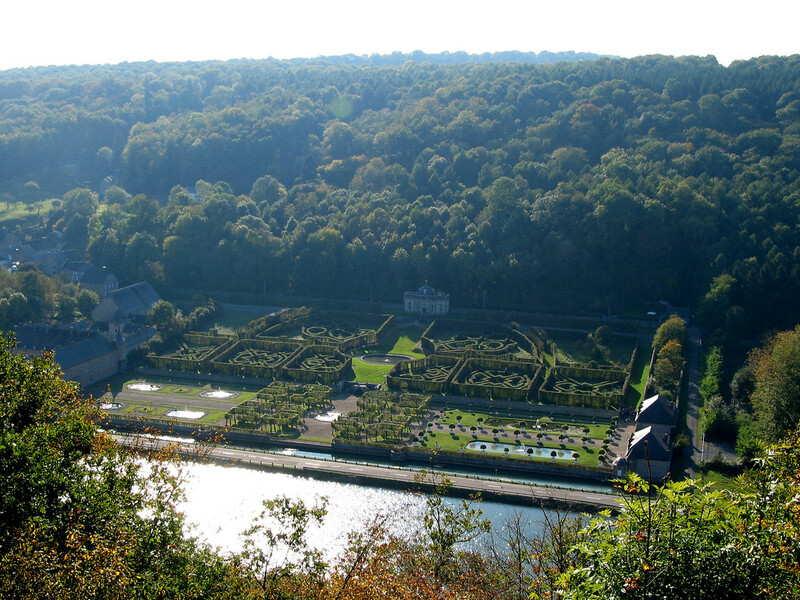 Or bump it up a notch,rent a bike and enjoy a scenic 30km ride to Namur! Alternatively soak in the views in a kayak or on a boat as you cruise down the river Meuse. Contact Dinant Evasion if you are interested in kayaks, cruises, and adventures in Dinant. 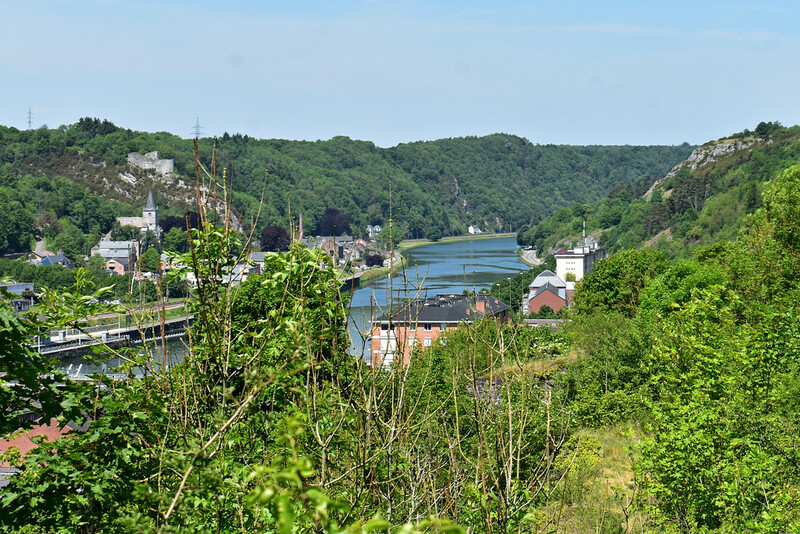 The next viewpoint was 2km North from Dinant along the Meuse river. The ruins of 16th century fortress, Crèvecoeur, overlook the village of Bouvignes below. Translated into English, Crèvecoeur means heartbreak and refers to the women who jumped off the cliff where the ruins remain today when a French siege in 1554 captured the castle. 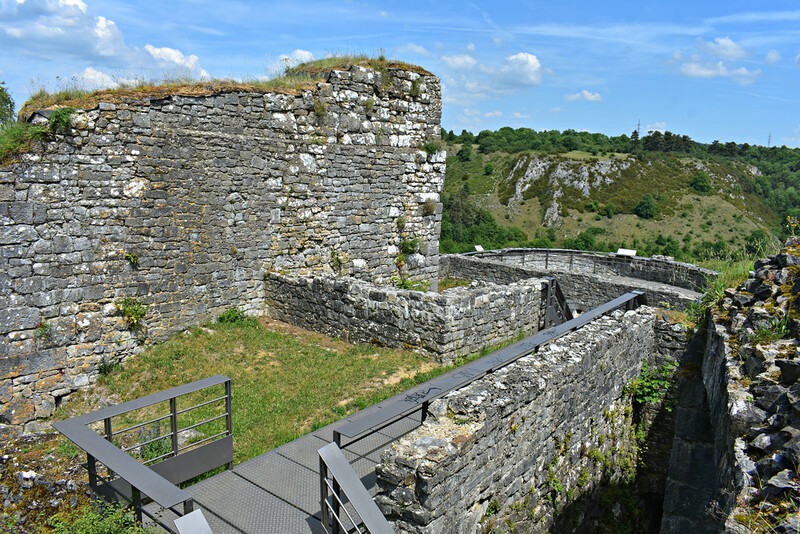 Modern stairs and railings have been built in the ruins and a metal walking path leads to a viewing platform overlooking the river Meuse. This was our favourite viewpoint of the day as were the only visitors there and had the beautiful far-reaching views of the valley for ourselves. Located 6km from the center of Dinant on the West bank of the Meuse River sits one of Wallonia’s major heritage site, the Castle and Gardens of Freÿr. International guests such as King Louis XIV and foreign treaties have been discussed and negotiated on the grounds. With ponds, fountains and hedge mazes and surrounded by hilly forests, this castle would be a gem to discover. Once you’ve finished exploring Dinant, use your next day to explore a cave! 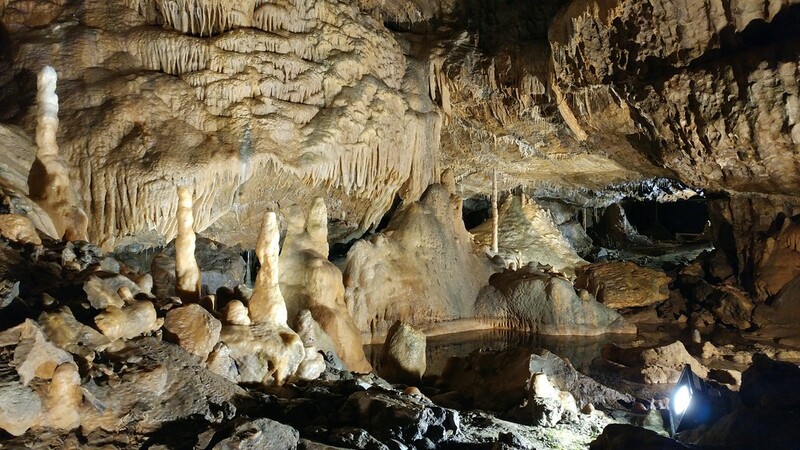 If you don’t want to venture too far you can visit Grotte la Merveilleuse. Touring the caves take 50minutes and admission is €9 for adults and €6 for children. Otherwise you can make the drive South to the immensely popular Domain of the Caves of Han by the village of Han-sur-Lesse. This is the only Belgian attraction in the country with three Michelin stars. After you’ve purchased a ticket ride the tram out of town and disembark at the cave entrance. Explore the cave with your guide for close to two hours and enjoy the light show inside. Adults pay €20 and € 14 for children aged 4-11. Get more for your money by getting a combination ticket that includes access to the Cave and the zoo. Alternatively you can travel further East to the Grottes de Hotton in the province of Luxembourg in Belgium. These set of caves were awarded two Michelin stars. Descend 65m underground for an hour long tour and find yourself in the largest gallery in Belgium. Prices are lower as well, € 10 for adults and 7€ for children under 12. 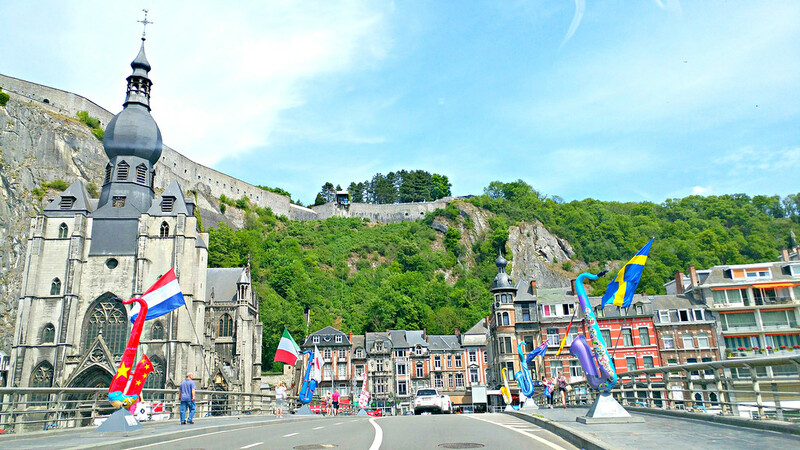 By train: Dinant is accessible by train from Namur, Antwerp or Brussels. Book your ride on Belgian’s national rail. By car: Road trips on Belgium’s highways are a breeze outside of the major cities. Dinant is a half hour drive from Namur and 70 minutes from Brussels. Tack on an additional half hour if you are departing from Antwerp or Ghent. AutoEurope is a great car booking comparison site to help you find the cheapest car rentals. Planning a Trip To Belgium? We utilize travel insurance from World Nomads for short trips abroad. You never expect something to happen until it does. Pack a peace of mind while on vacation. If you are looking for accommodation in Dinant, considering staying in the center of town at the comfortable Ibis Hotel, located near restaurants and bars. Alternatively if you would to sleep in a more scenic outdoor setting, stay in a lovely cottage at L’arche De Noé, a 6km drive from Dinant. Another great option is utilizing AirBnB. As a couple we find AirBnB strikes great balance between price with privacy.If you’re new to Airbnb you can sign up with a new account at Airbnb and get a $30EURO or $35USD discount on your first stay! Dinant is a wonderful little Belgian town to spend a day or a weekend trip in and around the area. 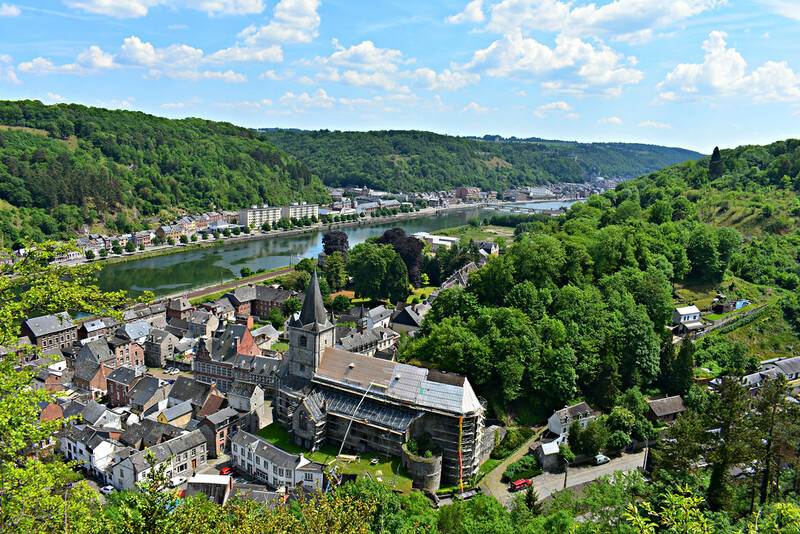 Whether you want to explore the musical side to Dinant, absorb the storied history of the area, or relax along the Meuse river, this pocket sized town is a wonderful respite from city living! There’s much more to Belgium than Brussels, Bruges, and Ghent and if you would like to take the opportunity to explore this quaint town in the Belgian Ardennes you won’t be disappointed! 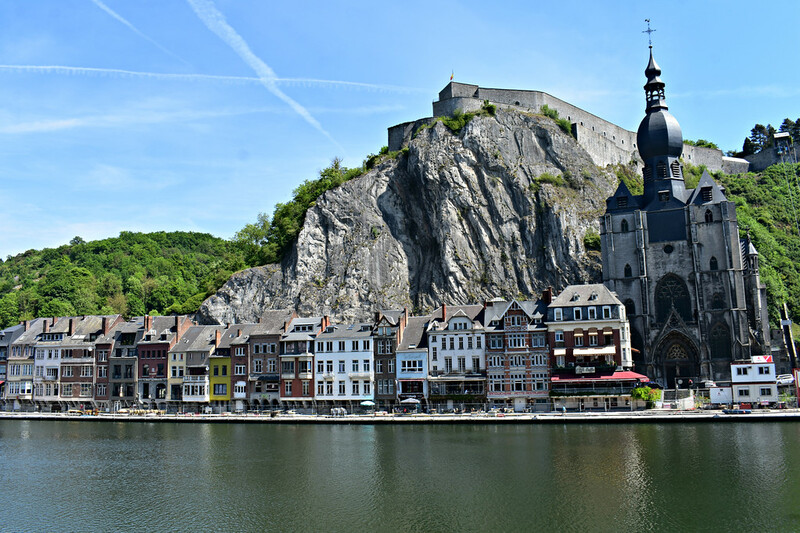 What do you think of Dinant, is it someplace you would visit? Do you prefer exploring cities or towns? And are there any off the beaten destinations near you that you would recommend to a friend? What the heck is there to do in Nordegg, Alberta? I spent a weekend there as a young teen w/ 2 girlfriends. We stayed in a small hotel downtown across from the Citadel. Its one of my favorite memories. Sounds like a fun trip for you ladies! Dinant is still a lovely little town to visit these days.